The skin is an organ that covers the body, a protective layer separating the internal organs and structures from the outer environment. It is comprised of an outer, waterproof layer (the epidermis), and an inner layer (the dermis). Consisting of hair follicles, sweat glands, nerve endings, and capillaries transporting blood, the skin plays a vital role in shielding the body from pathogens and environmental substances, and in releasing toxins through sweat. The gut-skin connection is an indirect one, but is, nonetheless, a significant connection. If there is inflammation present in the gut, whether chronic, low-grade or acute, it triggers more inflammation in the bloodstream which travels throughout the body, manifesting in different areas. Sometimes the inflammation is brought to the skin. In addition, toxins are expelled with sweat through the skin, and can cause the skin to react. Furthermore, like the inside of the digestive tract, the skin is covered in microbes which can be neutral, protective or pathogenic. 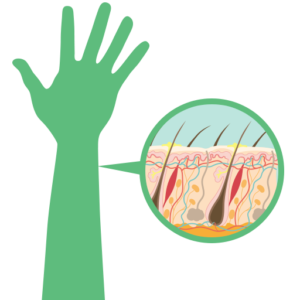 A skin reaction reflects what is going on inside the body. Instead of viewing the problem from the outside, and, hence, treating it from the outside, taking a look at how the digestive system functions, and how that function affects the entire body will provide a more comprehensive viewpoint from which to begin healing the conditions that affect the skin.